The Sow’s Ear is excited to carry Sugar Bush Yarns, a luxury yarn from Canada. The Sugar Bush range includes 11 different yarns, ranging in weight from lace to super bulky. 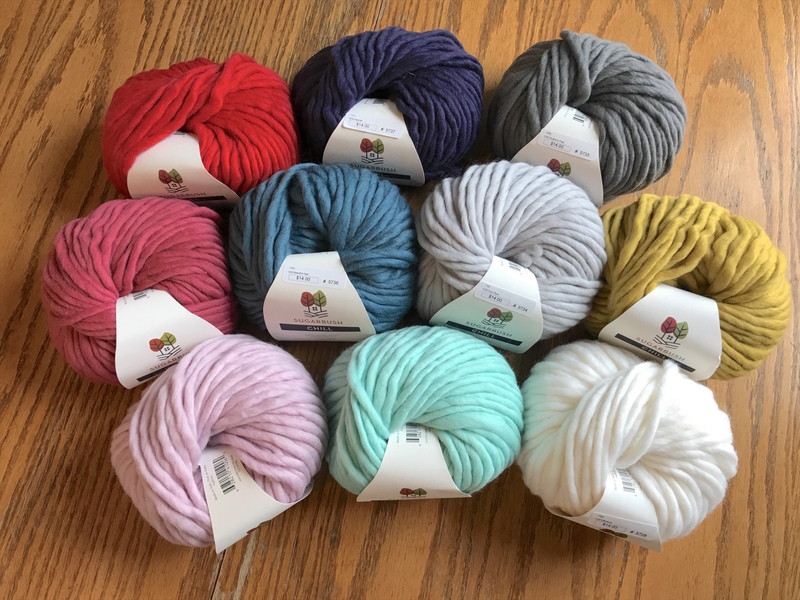 Sugar Bush aims to create yarns that will “inspire knitters and crocheters to create beautiful hand-knit projects that they’d be proud to wear or share” while serving as a symbol of Canada. Chill, a super bulky extra-fine Italian merino, is perfect for cold-weather projects that knit up in a flash. This single-ply yarn is very soft and light with a subtle sheen, making it perfect for luxurious accessories like scarves and cowls that do not feeling heavy. A versatile yarn, it knits up at 1.5 to 2.75 stitches to the inch on size 11 to 17 needles. An L crochet hook is recommended. Chill is put up in 3.5 ounce balls measuring 52 yards. Call for availability.